The initial conversation, consultation, and exploration of options are always 100% Free. Our primary goal is to educate you, present you your options, and then lastly work for you to help manage your debt so you can become debt free! Debt Management fees are paid on a monthly basis throughout the duration of the Debt Management Plan and typically makes up 15% of the total payment. This is not a yearly interest amount and just charged on the monthly payment so it works out to be around 3% on average per year. Take back control of your life and save $1000’s in interest starting today! 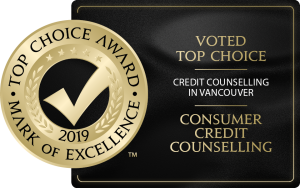 Book your free consultation with our certified credit counsellors throughout Canada. Our fees are automatically included as a portion (typically roughly 15%) of your single monthly payment. (Please note this is not a yearly 15% interest charge and a monthly fee amount). If your monthly payment is $100, $15 will be our fee +GST/HST while roughly $85 will go towards paying your debt. The savings in interest that we negotiate on your behalf will more than offset the minimal fees we charge. With the interest you are being charged monthly or daily now on the total amount of what you borrowed our fees are a percentage of the payment and therefore the same every month so you know exactly what you are paying and when you will be debt free! If you have $25,000 worth of debt with a 20% compounding interest rate (which most credit cards calculate on), each month your average minimum payments will be $750 with $416 going towards the interest and only $337 being paid back towards the total of the debt. With this structure the debt would take over 26 years to pay off and cost thousands and thousands of dollars in interest. With a Debt Management Plan we negotiate, on your behalf, to reduce your interest rate to 0% (or as close to 0% as we can!). This allows us to reduce the total monthly payment to something more affordable and pay off the debt faster. For the same $25,000 if we reduce the interest to 0% we can reduce the total payment to $500 per month. This $500 includes our fee of $75 + $3.75 in GST/HST. Therefore $421.25 each month is paid towards the $25,000 debt and since there is no interest the debt does not increase and will in fact reduce each month. With the debt structured this way it will take only 5 years to pay off the total $25,000 and you will save almost $20,274.00 in interest. If you want to get started on the path to financial freedom contact us and one of our credit counsellors will be available to help you!